Since her first trip through the American South in 1989, Carla Anderson has made an extended photographic study of the region's vernacular architecture and manmade landscape. Her photographs often center on aging buildings, ranging from old plantations in states of disrepair to more humble structures still in use, but her method of portraying them varies from image to image. In North Carolina, for instance, she photographed a series of barns from a head-on point of view, emphasizing their formal qualities, from their strongly geometric shape and rich palette of colors, to the weathered patina or patchwork quality of the construction materials. In other images, Anderson depicts people's yards and local parks as busy accumulations of visual forms. In the photograph "123 Allen Street, Kosciusko, Attala County, Mississippi, July, 1997," a garden spills over with a mass of eclectic decorations, while in "State Highway 97, Green Park, Wyoming County, West Virginia, July, 1997," a trio of white-washed crosses is partially obscured by fencing and clustered furniture. 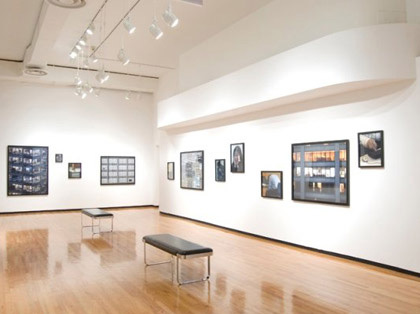 Anderson's photographs may suggest an ongoing search for a cohesive regional culture, but the titles of the images affirm the specificity of the places; in addition to indicating when the photographs was taken, the titles also include the city, state, and even a precise street address. Carla Anderson was born in Philadelphia, Pennsylvania in 1943. She received a BFA in photography from the Center for Creative Studies (now the College for Creative Studies) in Detroit (1976), and an MFA in photography from Cranbrook Academy of Art (1978).